The author, who served for over a decade as an officer and board member of the L5 Society and the National Space Society, is depicted doing what he would love to do in this original painting ©1988 by Mark Maxwell. See bottom of page for more information. The 20th anniversary of the National Space Society prompts us to look back on the history of the two organizations which merged to form the National Space Society in 1987. Most NSS members today have never been members of either of the two precursor organizations  the National Space Institute and the L5 Society  and may not be aware of their history. The two prior organizations resulted from the work of two great space pioneers: Wernher von Braun in the case of the National Space Institute, and Professor Gerard K. O’Neill in the case of the L5 Society. Although O’Neill himself was not involved in its leadership, the L5 Society was founded around his ideas and from his mailing list. Whereas von Braun produced designs for rotating space stations in the 1950’s, O’Neill took the idea a step further in 1969. 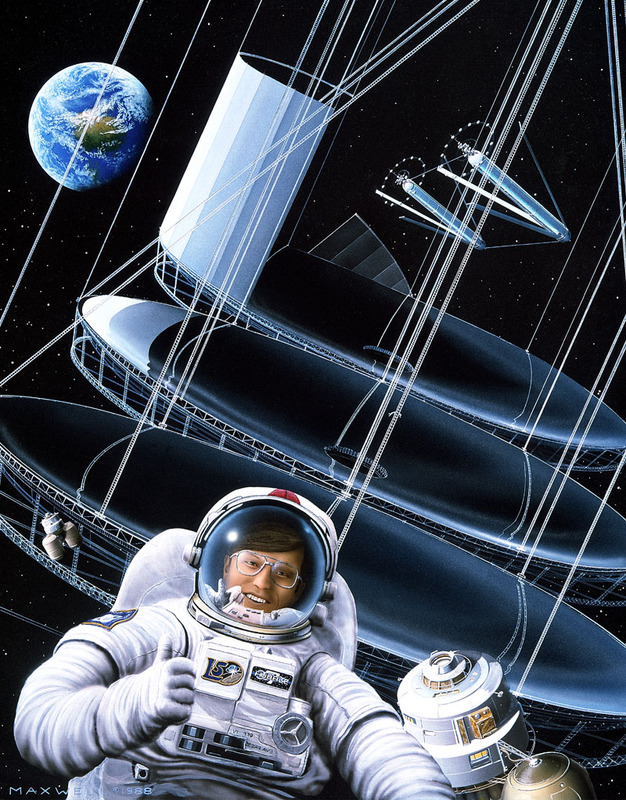 O’Neill, a physics professor at Princeton University, envisioned large rotating space habitats with an Earth-like environment on the inner surface, with artificial gravity produced by the rotation. O’Neill was one of the first people to ask the question: given current technology (in 1969), how large could such a structure be built in zero gravity? When the calculations came back with an answer in the tens of miles, O’Neill thought he was onto something significant. A key idea in O’Neill’s thinking was that such large structures could be built out of material mined from the Moon or asteroids to avoid the high cost of launching out of Earth’s much larger gravity well. Between 1969 and 1974, O’Neill worked out some of the technical details, mostly by himself. By late 1974, O’Neill had linked his ideas with Peter Glaser’s Solar Power Satellite (SPS) concept. SPS’s are large solar collectors in space that would beam energy for use on Earth or in space. O’Neill suggested that they be manufactured out of nonterrestrial material, providing an export product potentially valuable enough to make an O’Neill settlement economically self-sustaining. In 1973, George Hazelrigg, also of Princeton, suggested to O’Neill that the L4 and L5 Lagrangian libration points might be ideal locations for the large habitats that O’Neill envisioned. 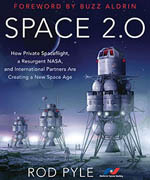 (The idea of locating a large structure at a libration point can be traced back further to the 1961 novel A Fall of Moondust by Arthur C. Clarke). L4 and L5 are points of gravitational equilibrium located on the Moon’s orbit at equal distances from both the Earth and the Moon. An object placed in orbit around L5 (or L4) will remain there indefinitely without having to expend fuel to keep it in position. The orbit around L5 has an average radius of about 90,000 miles, which leaves room for a very large number of space settlements even at this one location. O’Neill’s first published paper on the subject, “The Colonization of Space,” appeared in the journal Physics Today in September, 1974. A number of people who later became leaders of the L5 Society got their first exposure to the idea from this article. Among these were a couple from Tucson, Arizona, named Keith and Carolyn Henson. The Hensons corresponded with O’Neill and were invited to present a paper on “Closed Ecosystems of High Agricultural Yield” at the 1975 Princeton Conference on Space Manufacturing Facilities, which was organized by O’Neill. A sign-up sheet at the conference eventually made its way to the Hensons, who also obtained O’Neill’s mailing list. The Hensons incorporated the L5 Society in August of 1975, and sent its first newsletter to those two lists. The L5 Society started out as a shoestring operation in the back of the Henson’s small electronics company in Tucson. It is difficult today to realize the excitement that was generated in the early years of the L5 Society. Every issue of the L5 News contained reports of new studies and progress in the field. Underestimating the enormous weight of political inertia that would need to be overcome, L5 members at the time thought that they would really get the chance to personally live in space within their lifetimes. 1977 was also the year that two major books came out on the subject, bringing in a new wave of members. One of these was O’Neill’s classic work, The High Frontier. The other was T. A. Heppenheimer’s Colonies in Space. The latter book happened to be my own introduction to the subject. I remember at first passing it by in the bookstore because I thought it concerned things 200 years from now. I finally picked it up when a less expensive edition came out, and in the middle of the second chapter it hit me: this is something we can do right now! I immediately joined the L5 Society, started a local chapter, and have remained active ever since. One of the best successes of the L5 Society was its opposition to the United Nations Moon Treaty in 1979-1980. It was thought that the “common heritage” provision of the Treaty would stifle development of nonterrestrial resources, and that the Treaty would authorize warrantless searches of space facilities (which did not go over very well with people who actually wanted to live in space). The L5 Society hired Washington lobbyist and lawyer Leigh Ratiner, who gave intensive training to a number of L5 activists on how to walk the halls of Congress and talk to staffers. Notable among these were Eric Drexler, Chris Peterson (both of whom are current NSS Directors), and Marcia Allen. The successful effort centered on convincing the Senate Foreign Relations Committee to oppose signing of the Treaty. Since nobody was lobbying in favor of the Treaty, it proved possible for a small but well-reasoned opposition to sway the day, and the U.S. never signed the Treaty. The L5 Society did not fare as well in its next political battle, the fight over Solar Power Satellite funding during 1980-1981. The Department of Energy had spent about $25 million on SPS research from 1977 to 1980, but the Carter administration eliminated the $5.5 million for SPS that was originally in the budget for fiscal year 1981. L5 Director Mark Hopkins, who had been active for many years and later formed Spacecause and Spacepac, initiated an intensive lobby campaign to get Congress to restore the $5.5 million for SPS. Hopkins almost single-handedly set up a nationwide phone tree within a few days time, using a membership database of close to 10,000 members. The technique involved calling members in important areas and asking them to call other members in their area. When people were found who were willing to do this, a list of members in their area was dictated over the phone (or mailed, if there was sufficient time). I became heavily involved in this, and was appointed the first national phone tree coordinator for what eventually became the NSS phone tree. It was an effective lobbying tool. One key Senate staffer said that his phone was constantly ringing and that for an entire week the SPS issue would give him no peace (the Senator involved did switch his vote in favor of SPS). In the end, however, it wasn’t enough. The SPS program was cancelled. Its loss also signaled the loss of realizing the L5 dream anytime soon. O’Neill did not live long enough to achieve his hope of retiring in space. He died prematurely in 1992 after a long battle with leukemia. But the dream lives on. O’Neill can in some respects be likened to Columbus. Both men brought news of a New World, news that would inevitably change the course of history. In both cases, the New World was distant and expensive to get to, but full of natural resources waiting for its inevitable economic development. In the case of the New World of space, the basics of how to do this have been known for some time. The only real question is how long it will take. It’s our job to speed it up. 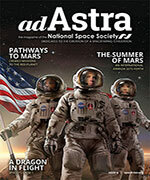 David Brandt-Erichsen was Secretary of the National Space Society at the time this article was published. See also the chapter on the L-5 Society in our online copy of the book Reaching for the High Frontier: The American Pro-Space Movement, 1972-84. Entitled HUBBLE 7, the painting (copyright 1988 by Mark Maxwell) depicts construction of the seventh-generation Hubble Space Telescope. This telescope consists of mirrors the size of a large sports stadium (a mirror this large could not be built on Earth). Shown here is part of an assembly line where dozens of such mirrors are being manufactured. Later, the mirrors will be placed thousands of miles apart, forming a single huge multiple-mirror telescope. It is exciting to think about all the things that could be learned from such a project. The construction workers for this project live in the two O’Neill cylinders in the distance. These cylinders (always built in pairs) are twenty miles long, containing on their inner surfaces a combined land area of 500 square miles and a population of some 5 million people. They rotate (each in opposite directions) to provide an Earth-normal artificial gravity on the inside living area. The company that contracted to build the telescopes, Hextex Corporation, was originally founded in Tucson as a result of mirror technology developed at the University of Arizona. Ninety-five percent of the materials used to build the habitats and the telescope were obtained from near-Earth asteroids (i.e., from some of the thousands of asteroids whose orbits cross between the Earth and Mars). Most of the remaining material was obtained from the Moon.